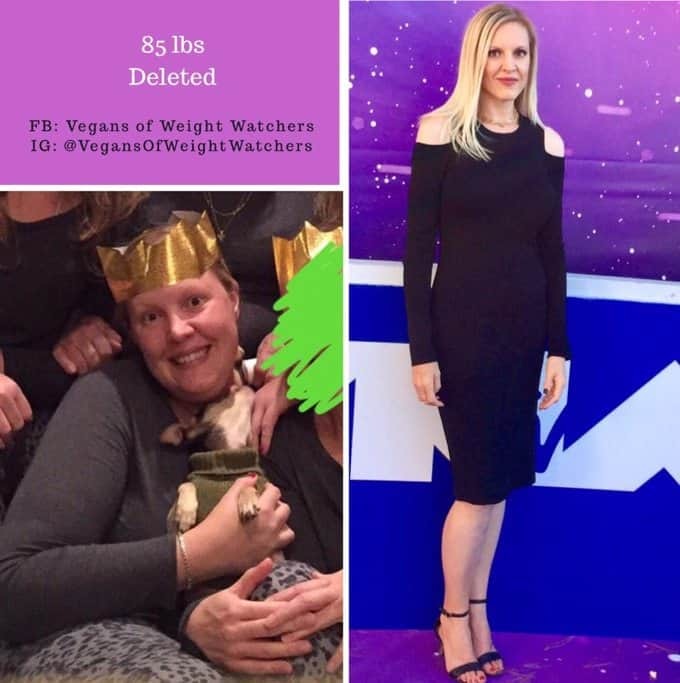 I am so pleased to introduce a new contributing writer to Simple Nourished Living: Vegans of Weight Watchers Lori Manby. 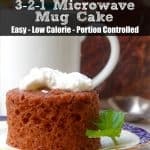 What was life like before you lost weight? What was your struggle? I was always the “big boned” girl. Instead of coming back and saying I wanted to eat, the defiant child in me snuck into the kitchen to eat leftover hot dogs off dirty plates as my family watched TV in the next room. At that age I wasn’t very stealth, so my mom heard me, and when I said I was hungry she of course made me a plate. It was exhilarating, even at that age it was freeing in some way. But like any addiction, each “high” makes it harder and harder to stop. From there I would spend 20 minutes slowly sneaking up and down the stairs, step by step, trying to remember where the creaky floorboards were and cringing when I’d missed one. I didn’t discover Santa wasn’t real by coming down when I heard noises of what I thought was him. I was sneaking into the kitchen for Hershey’s miniature candy in the bowl on the counter when I stumbled upon my parents quietly placing presents under the tree. Saying I heard Santa was the way I covered my tracks. The lying had already started. By the time I was in high school I’d developed a full blown addiction. I’d think about food all the time… what I would eat and when. No one else talked about it, so I hid it, which of course made it worse. Fast forward 20 years and I had successfully sabotaged jobs, friends, and relationships… every area of my life. 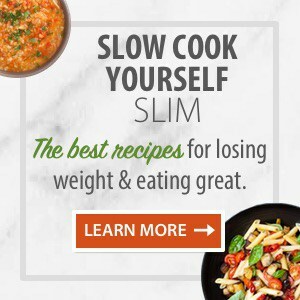 Had you tried to lose weight in the past? I lost the most weight in the 90’s taking the prescription weight loss pill Phen Phen. I was able to maintain a “healthy weight” for several years, but after collage I’d gained three sizes in a year. I’d rushed into a marriage too quickly and given up things I was passionate about in the process. I felt like a failure, so I sought comfort from food. From there I tried every diet, pill, shake, herbal tea, even hypnosis. 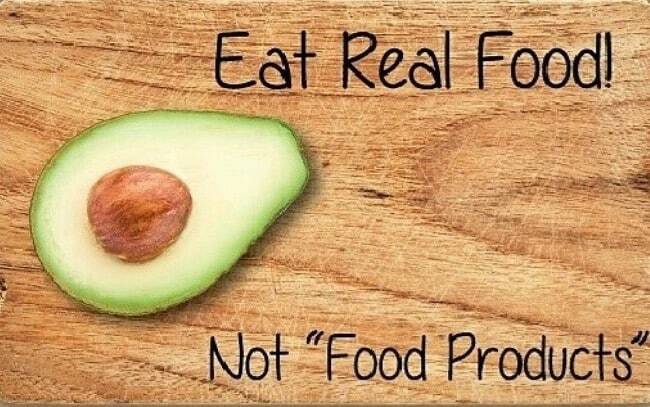 I did high fat, low fat, Atkins, Nutrisystem, Jenny Craig, 21-day detox, Raw til 4…I can go on. But like all “quick-fix diets,” I would lose some weight but never enough to make me motivated to keep pushing, so I’d gain it all back. Then I’d binge from feeling deprived, then eat from the guilt that comes with binging, then binge because I felt like a failure… the cycle repeated over and over and over again. Eventually I would joke about my destiny of being the “funny fat vegan who loved food too much to be skinny” I made myself believe it, so that’s what I became. What was the “a-ha-moment” that made you want to lose the weight? I went vegan for ethical reasons two years prior to joining WW, October of 2013, so weight loss wasn’t the focus. By January, 2016 I had gained 20+ more pounds on TOP of the weight I already needed to lose. With vegan versions of literally everything, I certainly wasn’t drinking green juices and eating salad. When I learned Oreos and Thin Mints were vegan, I had even more of an excuse to overindulge. Vegan food is “healthy” right? My blood work was good, my cholesterol had dropped drastically, even my blood pressure was within healthy range… I was in complete denial. I wasn’t the “healthiest fat person” I’d deemed myself to be. I would walk a block and my calves would cramp so badly I had to stop. AFTER A BLOCK! I was with a client once who asked if I minded taking the stairs 3 floors up. I panicked. I insisted they go first to hide my pushing off the rail. I was out of breath before the first floor. I pretended something was caught in my throat to hide my heavy breathing. I beelined to the restroom, trying to hide the limp from my aching calf. I ripped my suit jacket off as the door closed because I’d already started pouring sweat. After I got my breathing together, I wiped the sweat away with toilet paper, threw my engaging personality back on and emerged unaffected. My entire life had become smoke and mirrors. It was exhausting. The only thing I was succeeding at is that I was slowly killing myself… with food. Then, Christmas of 2015 my sister gave me a digital picture frame. Little did I know that frame would quite literally save my life. Two weeks later, I transferred photos I hadn’t seen on a screen larger than my phone in 20 years. As I sat reminiscing over the past two decades of my life, I did a double take a few photos in. Who was that big girl in all the photos? Wait, that was ME???? Seeing myself photo after photo, bigger and bigger, year after year was mortifying!! How did I let myself get this big? Denial and excuses, that’s how. 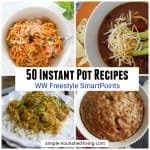 Was this your first time joining weight watchers? Around 2005 I’d lost weight with Weight Watchers. I was back in a body I could start to love and succeeding at life again. But then work got busy and it was hard to get to weekly meetings. Not to mention tracking by hand was super challenging for me. So I took the easy way out and used the “it’s too hard with my job and lifestyle” excuse. 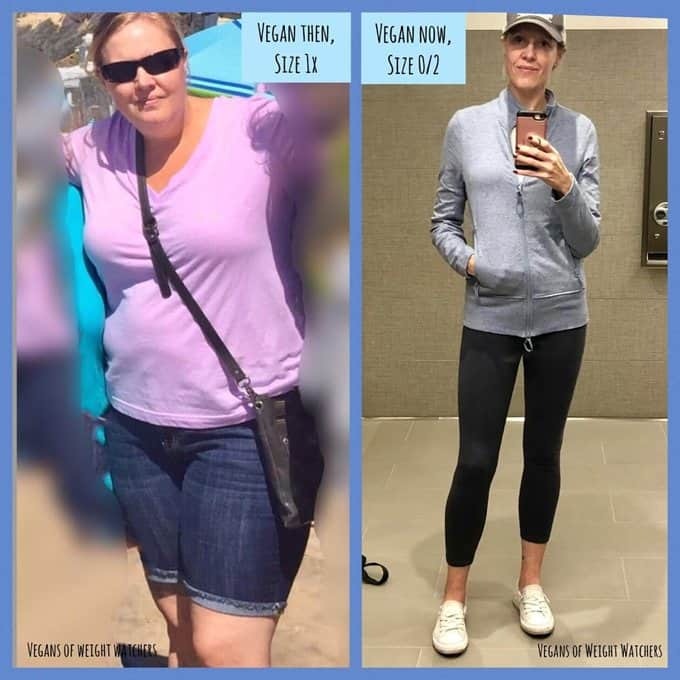 Why did you choose WW again to help you lose the weight? I was diagnosed with Binge Eating Disorder (B.E.D.) two years prior. But seeing the photos passing by on that frame was the final straw—I’d hit rock bottom. In that moment knew I had two options… be honest with myself about my food addiction and get the help I needed. Or, continue to let the guilt, shame, and excuses I convinced myself to be true continue to sabotage every area of my life. I knew if I wanted to change my body, I’d have to change my mind. So, after I picked my jaw up off the ground, at 210 pounds, I instantly re-joined Weight Watchers. The program had the structure I would need while I figured out a way to stop the record of doubt playing over and over in my head. Now I just needed to figure out a way to make it work with my binge eating behaviors, lack of exercise routine, and “junk food vegan” diet. How long did it take you to hit your goal? How long have you been maintaining? I started January of 2016, weighing in at 210 lbs, size 1X. I set an aggressive goal to be a size 8/10 by that time next year. I didn’t know or care what the actual number would represent that on the scale. Eight months later—when I hit my size 8/10 goal—I had professional photos taken to mark the smallest I’d ever been. But secretly, I thought maybe I could keep going, so I stayed in weight-loss mode. Before I knew it, Christmas arrived which was eleven months after my start date… in 361 days I had hit a size 4, I’d lost 75lbs. I announced I’d hit final goal from the rooftops! I rejoiced with a new wardrobe and passed my size 6 pants to a friend Susana who was shrinking with me. 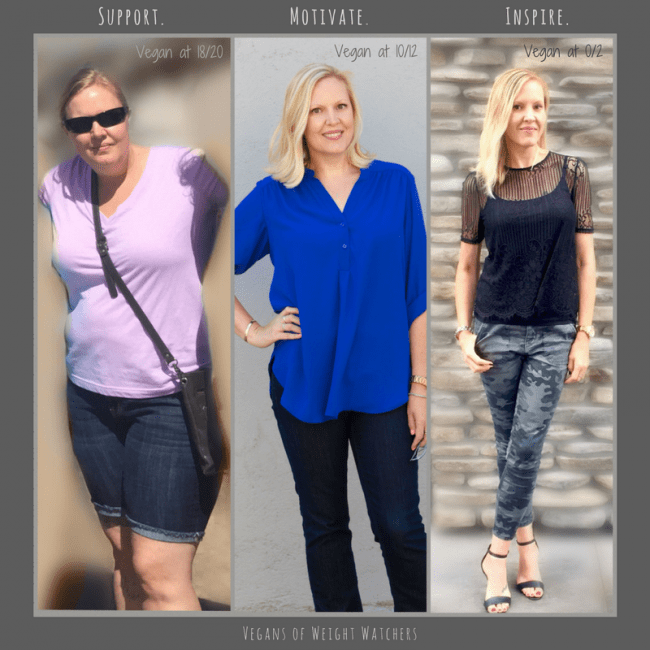 I started the scary journey into maintenance mode… but the weight kept creeping off. My physician was monitoring me along the way, mostly to put my mom’s mind at ease (sorry mom). She assured me my body would indeed stabilize when it reached the size it needed and most importantly, the size it WANTED to be… and it did. Two months after that I stopped losing at a size 0/2. A SIZE 0/2?!?!?! You mean my body was carrying 80 (ish) POUNDS MORE THAN IT WANTED TO? You mean I’m NOT big boned and I DON’T have bad genetics? My mind was blown. It’s been a year and I’ve never looked back. I have a project management background, so I used those skills to create and implement systems to make WW work for my binge eating behaviors, lack of exercise routines, and “junk food vegan” diet. In the process I discovered my true purpose in life and my biggest passion: Share my deepest, darkest secrets with Binge Eating Disorder and use my skills to Support, Motivate, and Inspire others with similar stories. 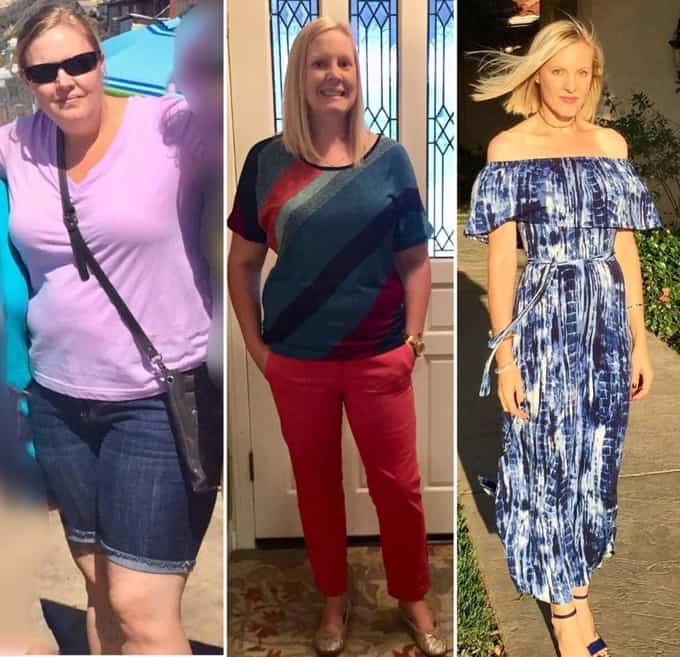 A few months into my loss I started a “secret” Facebook group for friends who saw my results and wanted me to teach them to do the same. Six months later, 14 active members had deleted 700 lbs… word spread in the process. As I honed my skills, I was asked to do private coaching. But as the demand grew, the hours in the day shrunk, and my vision had always been to support people on a larger scale. I want vegans and non-vegans, anywhere, at anytime, to have access to help if they needed it. I knew that meant I’d have to “go public” with my story… but was I willing to open myself up to the judgement and ridicule poisoning people everywhere to achieve that? It ended up being my Dad who answered that question, not surprising, he was always my biggest fan. We lost him to cancer in 2013, so he wasn’t here to see my transformation or cheer me on along the way. I’d reached to call him (still do) so many times to share something I was excited about, waiting to hear “Way to goooooo LORI!” If you knew him you’re laughing because that’s EXACTLY how he’d say it. I was even starting to doubt if my dream for Vegans of Weight Watchers was even realistic. As soon as I’d mentally uttered those words, he sent the reassurance I needed, from a place he knew I would listen: Facebook. Through Facebook I’d become good friends with a woman, Carmen, a fellow vegan, who I greatly respect and admire. It was over dinner she gave me the push I needed… It wasn’t about me anymore. People needed help and I had the ability to give it to them. I’d lived my whole life for me, it was time to stop being selfish and give back. That “all or nothing” took control and that night, the public Facebook Page “Vegans of Weight Watchers” was born. It’s where I give tools, coach on strategy, and help others stop the record of doubt on repeat in THEIR head. 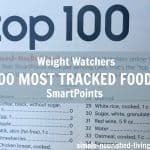 The page has things like my “Tips & Tricks” document and short videos teaching the everyday practicals I use to control binge eating. You’ll find organized photo albums filled with delicious vegan food with point values, I’m a stickler for that… but I digress. 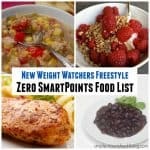 The video “Freestyle This” breaks down how the new program translates not only to vegans, but anyone struggling to understand portions, binge eating, and/or who like me, don’t eat many foods on the zero point list. 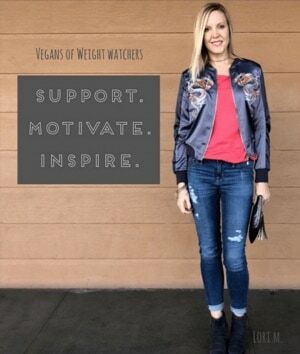 Last month, I opened up the closed group “Vegans of Weight Watchers – The Group”, where non-vegans are welcome too. My goal is to build a community with the same mission as mine: To Support, Motivate, and Inspire others by sharing our stories and teaching the secrets to our success. Why do you do this, what’s the catch? It’s simple. I’m tired of pretending this disease isn’t real – that’s what got me into this mess to begin with. This journey has been life changing for me. I’m a completely different person physically, but more importantly mentally. I’ve managed to find the girl my doubt killed YEARS ago and bring her back to life. I feel deeply compelled, happily obligated in some way, to help to others in similar situations looking for a way out. I’ll be the first to admit meticulously researching, and doing what I call “Playing Points” is my guilty pleasure, and one I have no desire to stop. I have the passion, the ability, and, most importantly, the mental strength. So the way I see it, there is only one option…share my experiences and Change the World, one Point at a Time. 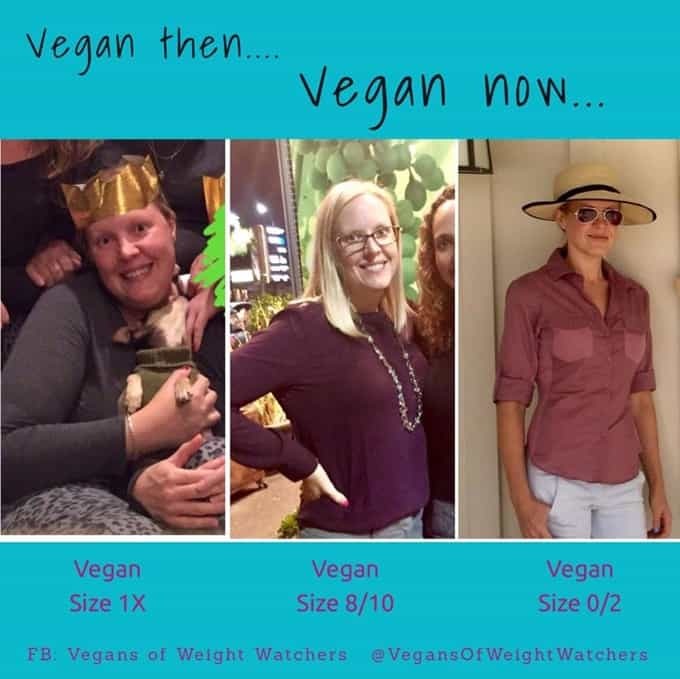 Please note: Vegans of Weight Watchers techniques are based on my own experience. 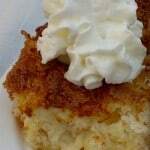 I do not consult with Weight Watchers coaches nor I am employed or endorsed by Weight Watchers Corporation. 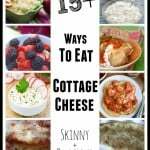 Previous Post: « Grocery Shop Online to Save Time & Money While Whittling Your Waistline!